Remember when cereal boxes had treasure in them? It made even eating the most bland breakfasts bearable. And while baking soda submarines and Wacky Wall Walkers were great, baseball cards were always better. 1971 Kellogg's Baseball is the second set from the cereal maker. The 1971 Kellogg's Baseball set has 75 cards. Smaller than traditional cards, each measure 2 1/4" by 3 1/2". But that's not what stands out most. In the grand Kellogg's baseball card tradition, they come printed in 3-D. Outside of the gimmicky technology, the design is simple. A thin white outer border gives way to a blue spotted frame with "3-D Super Star" written across the top. The middle of the card has a posed player photo. And while ads for the cards say they're autographed, they are only facsimile signatures. A red star has the player's last name and position. Card backs have a standard layout, albeit one with lots of information. 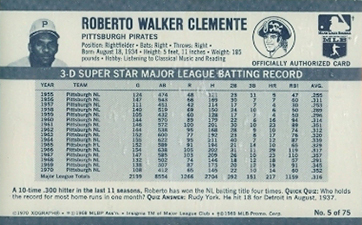 The top portion has the player's vitals, a small head shot, and logos for the team, MLB and MLBPA. Full career stats and a short bio are below. Every card in the set has a variation based on the copyright line. Cards can be found with or without "1970" written before the XOGRAPH registered trademark. Several other cards in the set have error-based variations, most with very subtle stat changes. 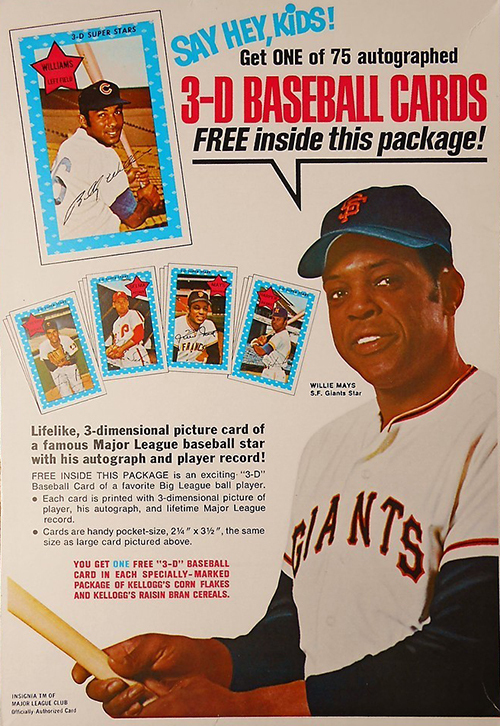 1971 Kellogg's Baseball cards came packaged one per specially marked box of Corn Flakes and Raisin Bran. To protect the cards, they were placed in white wrappers. These are easy to see through and know which player you're getting. 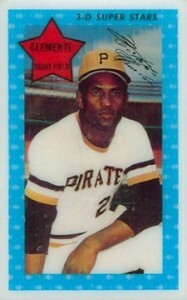 Of all the baseball card sets Kellogg's made over the years, 1971 is considered to be the most difficult to complete. It's the only time there wasn't a mail-away offer for complete sets. 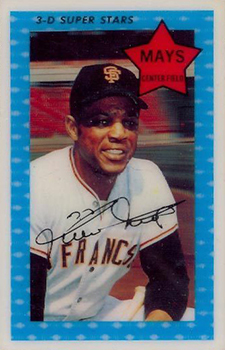 The main condition issue for 1971 Kellogg's Baseball is the plastic of the card stock. It's common for it to crack. Otherwise, cards hold up very well. 75 cards. Cards can be found with or without "1970" in the copyright info. * denotes scarcer version of the card. A truly ugly card front, at least the back is a bit easier on the eyes.